How exciting! Your child is starting school in the New Year. You have chosen to enrol your child in after school private piano lessons with Music Matters in Term 1, 2019. Congratulations on a making great choice for an extra-curricular activity which will support your child’s education. There are many ways parents can become involved in music lessons once they commence. This blog, however is more about how you can give your child a head start on their first music lesson. The long school holiday period over the Christmas break is the perfect time to introduce your child to interesting and meaningful musical games. Music Matters lessons for young children are based on simple, step by step processes which introduce music basics. 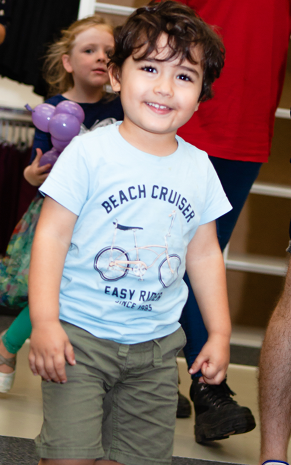 We build confidence in children by helping them to gain competence and experience in these basics which include theory, rhythm and piano playing. Then we move on systematically to broader musical concepts which lead to more advanced playing. 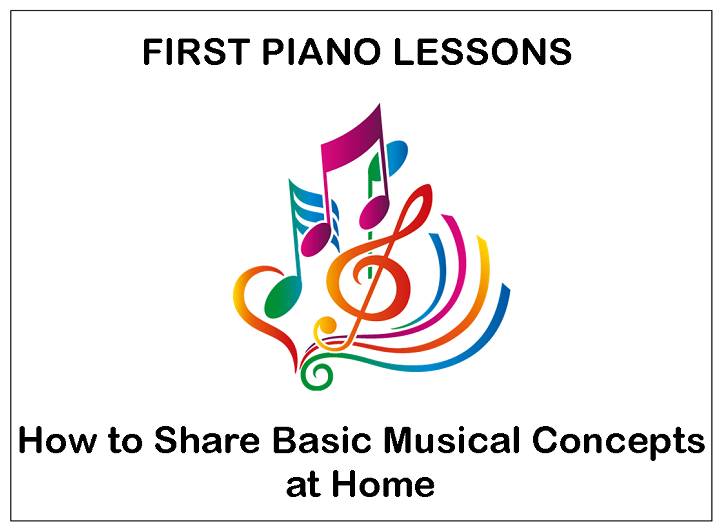 However many of the simple introductory basics have to do with separating the left and right hand, learning finger numbers, finding the letters used in music on the piano and counting out simple rhythms. When a child learns these basics before their piano lessons start, they may more easily understand how to play the piano. If you are interested in giving your child a head start in piano lessons then the 4 ideas below are for you. These ideas are published here especially for people like you who are keen to see their children get the best out of their music lessons. These are some of the same steps we use in early piano lessons. We have made them into quick, easy, interesting games so that you can easily share them with your child. With school holidays coming up and the end of year fast approaching now is a great time to start thinking about piano lesson for next year. If you haven’t already enrolled, call me today. 0418 563 226. Holidays are for long, relaxing days, soaking up the sun and sleeping in but if my memory serves me well children still love to have activities over the holidays. Sooner or later your child will come to you asking “What can I do now?”… just when you were about to nod off after lunch. Take this cue as an opportunity to introduce some piano basics. Preparing for music lessons can be an educational and interesting activity while you are on holidays. A simple internet search will reveal many music ipad apps that even young children can play to help them learn the letter names on the keyboard. As much as I prefer not to use IT on holidays, it will most likely have its place. Hand and Finger Game: you will need black paper and a pencil. On a blank piece of paper trace your child’s right hand and left hand separately. If you are down the beach you can do this and the following three activaties on the sand. Draw the letters R.H. and L.H. on the hands and the numbers 1 to 5 on each finger, starting with the thumbs as number 1. Pinkies are number 5. Ask your child to point to the hand and finger number you “request”. “Point to right hand finger 5.” Once they understand where each finger number is, make it into a game by seeing how fast they can find the fingers. Swap roles and have them ask you to find the correct hand and finger number. To step it up make the game into a speed game. Write down 10 requests on paper and start a timer. Tick off each request as your child finds the correct finger and hand. Stop the timer. Try the same request list again and see if they can beat their own speed. Ask your child to make a list of 10 requests and repeat the speed game using the timer. Young children love to use timers and to challenge themselves in repeated activities. 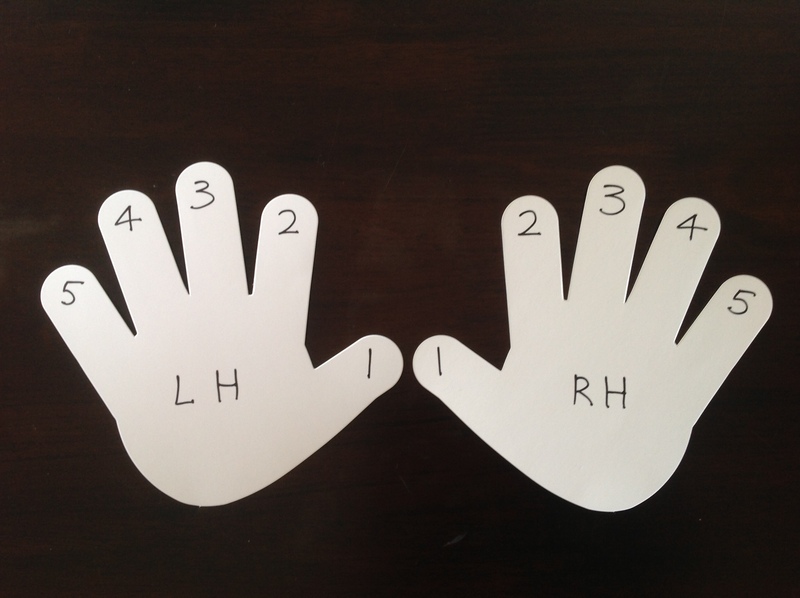 This simple hand finger game is an essential part of piano playing. 2. “Counting In” Clapping Game: you will need hands to clap with, that’s it! This game creates an opportunity to set up some fun clapping rhythms. You don’t have to know much about music to set up this game. Its a simple as counting from 1 to 4. The main reason for this game it to show your child how to count in evenly. Show your child how to clap four times evenly, as if clapping at the end of a show, but slowly. Ask them to copy you. Count to four out aloud as you clap the four claps again. This shows them that the counts and claps belong together. Ask them to clap at the same time as you are after you have counted aloud to four. For instance say “one, two, three, four” and then start clapping. See if they can start clapping at the same time you do. This counting to four is called the “count in.” Learning to count in and start playing music in time is a vital skill in learning music and it can be taught to your pre-schooler very easily well before they have their first music lesson. Trust me, your teacher will love that you have taken the time to teach your child to count in! 3. Opposites in Music: UP and DOWN: you will need paper and pencil. Musicians learn about many opposites. These are the same in music as for life in general, but sometimes they can be a little challenging. for instance. The word “UP” usually means up towards the sky. When you play the piano UP means “to the right” and “DOWN” means to the left. This is a meaningful opposite to teach pre-schoolers before their first piano lesson. Simply draw a straight line on the paper. Place an arrow head at each end of the line. Divide the line in the middle with a shorter line. Write the letters UP near the arrow on the right and DOWN near the arrows on the left. Stand or sit in front of the line with your child. Put out your right hand and say “going up”. Ask them to copy you. Put out your left hand and say “going down”. Say, “If UP is to the right and DOWN is to the left, I wonder where the middle is?” Point out the middle of your line to your child: “Here it is”. Use a piece of lego or other light weight small article and start the game. Each person has three pieces of lego. Select different colours for each of you but make your three pieces the same colour. Ask you child to toss the lego piece towards the end of the line you select. You have three choices: up, down or middle. Swap roles and let your child ask you to toss your lego pieces up, down or middle. Then present three more choices. Instead of saying UP, say “to the right”. Instead of saying DOWN, say “to the left. Middle remains the same “middle”. This may seem like a simplistic game but it presents is very important musical concept and will give your child confidence to know this at lesson. 4. Groups of two and three black keys on the piano keyboard: you will need a pencil and paper. Music Matters Piano Keyboard showing black key groups. Did you know that the black keys on the piano come in groups of two and three? If you have access to a printer, print our this picture of a small keyboard. If not, simply draw the keyboard on paper. Point out the groups of two black keys to your child and ask him/her to draw a circle around them with the pencil. Find the group of three black keys in the same manner. That’s it! 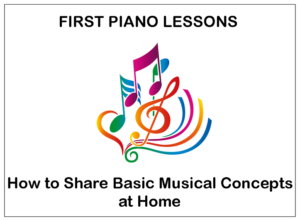 Whilst these 4 games seem simple and straight forward to adults, they are actually learnt activities and underpin the basics of playing the piano. Good luck with your games. If you are interested in more games please contact me on 0418 563 226.